Omega Seamaster Cosmic 2000 diver watch in overall very nice condition, year 1970. Reference is 166.137. This watch is the version with the desirable black date-wheel and the three-liner dial. Automatic Calibre 1012 in good working order. The bakelite bezel is in remarkable good condition - usually this part has some cracks and areas, where the colour is missing. Very clean dial and hands, case is unpolished. The steel bracelet has some stretch. Diameter without crown: ca. 39 mm. The watch has a nice presence on the wrist without looking bulky, since its height is just 11 mm. Part of the offer is an original dial (four-liner version) as spare part and a second bakelite bezel. 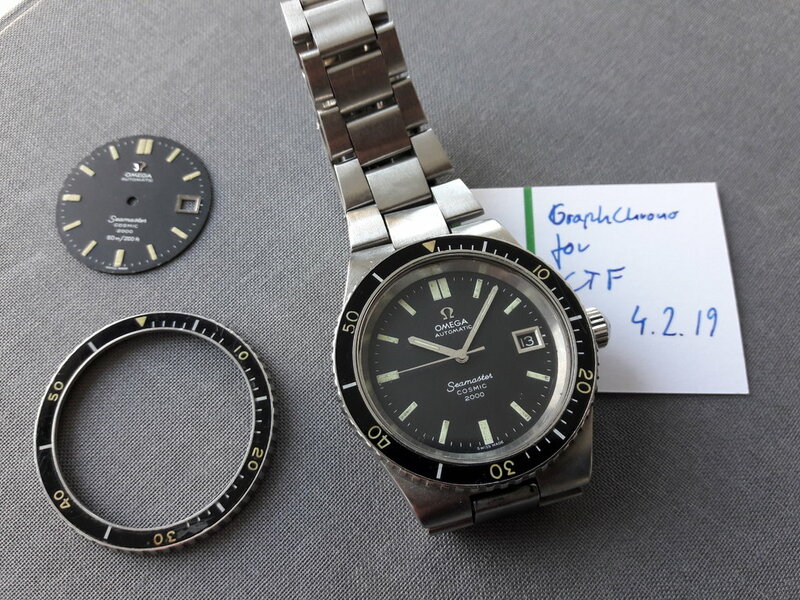 This part is very very hard to find, Omega doesn´t have it in stock anymore, they have recently changed it to a bezel insert that is made of metal. Watch and the two parts are sold together.